Blog submission sites are crucial for bloggers and webmasters. They need to submit their blogs to rank higher in SERPs. Just, publishing nice posts is not enough. The process of blog submission is easy and mostly free. That is why a large number of people get attracted to this way. Further, this activity has many benefits. We will learn about them later in this post. List of High PR Blog Submission Sites. If you Google search the keyword high PR blog submission sites, then you can find a number of sites claiming to have a list of such sites. To a large extent, those lists are the same. To add further, many of these sites do not exist or have disappeared. It means that such sites’ lists were not manually verified. I am also presenting a list of high PR blog submission sites. Here, you may ask, how is my list different from the others? My answer is yes, it is different from most of the others. Our list is an authentic high PR blog submission sites list, which is handpicked and found to be working. So, to understand these sites, we will discuss the following points. What are blog submission sites? List of blog submission sites. How can we submit our blog to these sites? What are the benefits of blog submission sites? What are the drawbacks of these sites? Which Google update has affected the blog submission sites? Are these sites still relevant? How can we check the quality of blog submission sites? How many of these sites should we use? 1. What are Blog Submission Sites? These websites store information about thousands of blogs which are arranged by the categories. The number of categories could vary anything from 10 to 30. Organization of blogs in such a way helps a visitor to find related blogs easily. Some people call these websites as blog directories. You can compare them with Yellow Pages as they also list the online businesses. Many blog submission sites have RSS feed option. Whenever you publish a new post, it gets available on these sites. The blog directories earn through ads. Many of them also charge money for listing your blog. 2. List of Blog Submission Sites. You can find the full list of blog submission sites here. 3. How can we submit our blog to these sites? Password (should be strong). It should have a minimum of 8 digits and should be a combination of one upper case letter, one lower case letter, one number, and one special character. It should not be the same as your name or username or email id. Your Blog title, like in my case, the blog title is Hari For You – Blog Journey. 5 Keywords against which you want your site to be ranked. Category of your blog. It may be different on different sites as it depends on the options the blog directory provides for the category. A brief description of your site. You will need these details for all the blog submission sites. So, keeping them handy will save your time and make the process of blog submission easy. After visiting a blog directory, you have to sign up. Then, you can start the blog submission procedure. You can try two or three blog submission sites daily until your list is exhausted. 4. What are the benefits of Blog Submission Sites? Broadly, we can imagine three benefits of blog submission sites. a) You get a backlink. Many websites provide do follow backlinks to your blog. But, a few of these sites only give no follow backlinks. As you know, no follow backlinks do not give any link juice. But, they should be part of your link building exercise. These links are not powerful if you compare them with the contextual links. Still, these do follow backlinks provide some link juice to improve your blog ranking. b) Your blog gets wide exposure. When you create an awesome post, you want to present it to a large number of audiences. You can partly achieve this goal when you submit your blog to the blog directories. The audience of the blog directories may visit your blog if it is relevant. Many visitors may even subscribe to your email list. So, blog submission activity has the potential of giving you some good traffic. c) It improves the DA of your blog. Domain authority of your blog depends on the number of good quality sites linking to it and the age of your domain. So, backlinks from blog directories enhance the DA value of your blog. If you analyze any high domain authority site, you will find thousands of other sites linking to it. For example, take the case of Labnol.org. It has a domain authority of 76 and the number of sites linking to this blog is 7282. 5. What are the drawbacks of these sites? Excessive use of these blog submission sites for getting backlinks may backfire. Google may consider this practice as spamming and may downrank your blog. So, you should restrict yourself and have only say, 20% of your backlinks coming from these sites. Many sites ask for money to list your blogs on their sites. Some blog submission sites ask for a reciprocal link on your blog. Many of you may stay away from unwanted links on your site. Without money or reciprocal links, these sites take months to list your blog. Moreover, it is also possible that these sites do not list your blog at all. 6. Which Google update has affected the Blog Submission Sites? Google’s Panda algorithm has penalized many blog submission sites. It termed them low quality or spam sites. These sites generally allow a blog’s listing without editor-review. Google feels such sites allow people to manipulate link building. As per Google, link building should happen naturally. It means if you have created a unique, valuable content, then people should consume it and share it. And backlinks generated this way are natural and valuable. 7. Are these sites still relevant? It is a valid question. After Google’s Panda updates, are these blog submission sites still relevant? I would say, yes. But you have to use them selectively. And, you should not submit your blogs to hundreds of sites. As told above, not more than 20% of your backlinks should come from these sites. Do not afraid too much. You can submit your blog to high-quality sites and reap the benefits they provide. 8. How can we check the quality of Blog Submission Sites? You can take the following steps to arrive at the correct answer. Check if a site accepts your link without any editor review. If so, it is not a good site. And do not submit your blog there. Ensure the website’s age is more than two years. The site should have high domain authority. Since higher DA value is a sign of a quality site. Check if the site has a high page rank. Also, check if the site updates regularly. If yes, it is a good site. 9. How many of these sites should we use? It depends on the particular blog. As stated above, not more than 20% of your total backlinks should come from these websites. If you have identified a quality site, then you should not fear, and submit your blog there. If you use the blog submission sites wisely, you will get the benefits for sure. Sometimes, you become greedy and submit your blog to a large number of sites. This action may bring trouble for you. Further, Google may consider you a spammer and penalize your site. I am reminding you again, do not work on poor sites. If you have anything to add, please write in the comment area. Thanks for Sharing, High PR Blog Submission WebSites. Thanks, Pavitra, for your comments. This blog commenting site is great also all are working fine instant approved. I will share it with my everyone friends. Thanks for your good experience also sharing this site . Thank you for Sharing this information about blogging and high pr do follow links which is necessary for blogger like mine. Thanks for sharing this these tips with us. Too good. Really helpful for many people mainly bloggers like us. And i would like to thank you for giving us links for submission site. Nice. Hope you will provide this kind of information regularly. As I am a starter in blogging, you help me more to find the sites and some more useful information. Thanks, Hari Mohan for sharing this. i dont hve a blog but a website..an i also submit my site name there in those directories? Thanks Hari for sharing such great blog submission sites. It’s really help me a lot. Thanks for the list. It is very helpful to build backlinks from them. Amazing ! This list of blog submission sites is very useful, and this is what the new bloggers searching. Thanks for sharing this list. I really appreciate your work as searching the quality blog submission site is not an easy task, but you have made it easy for me. I submitted the article on above sites and got instant approval from many sites. I will share it to my SEO network. Hello Sir, Your work is so good I like Your articles writing your writing is so clear I liked it you are a great writer. I appreciate your work you are working hard. I have bookmark your website. I will visit your website again soon. Actually, I want more sites for Blog commenting. But really done a great job. Nice list provided by you. Great efforts and very nice collection of the blog submission sites. The list is very helpful. Wonderful collection of commenting sites. I really like it. It will be very helpful for me. Thank you for sharing the site list. Very useful and informative site list. Keep updated. Nice blog. Thanks for sharing a valuable information. Nice Information Hariforyou and thanks for sharing this kind of information. Thanks for providing these details it will help a lot. Thank you for the very grateful information about seo stuff and pr blog submission sites which i been looking for.. I read your articles This post is very useful to me. I really need this post. Thanks for sharing this article its very useful for me . keep it i request write lot of article like this. Its a nice article, please keep update. I am always follow you. thanks for the valuable information. i really did not know that many backlinks from blog directories can be spam. now i came to know. thanks again for sharing knowledge base article. Nice information about for blog submission sites list and very useful to blog traffic seackers. Very Good List. Really helpful one. Must say it’s a unique list. I have never found these blogs before. Thanks. This is really a good post. I really love and like this Thanks again. i am creating the content for above blog and post them as completed..
Nice list of high PR blog submission sites. Thanks for shraing the post. It is very informative. Thanks for sharing the post. It is very useful blog submission sites list. Very nice article sir. Blog submission sites are really helpful. use some with the content on my blog whether you don’t mind. Natually I’ll provide you with a hyperlink on your net blog. Always use your real name while commenting. If you want to show some of my site-contents on your website, then you can use the title of my post with link back to my blog post. This list was really helpful and list of high PR bLog submission worked for Me. Keep Sharing such nice content with us. Amazing article created by you. I follow this sites to increase my rankings in search engines. Please also share ping submission sites list. 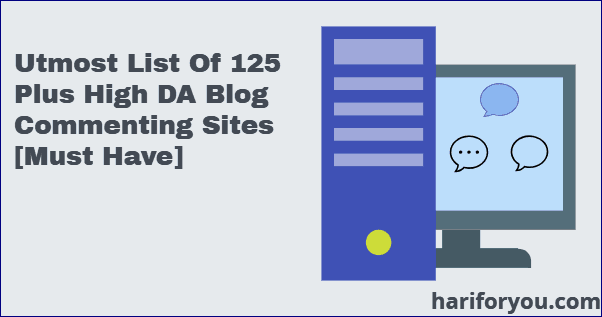 Thanks a lot for sharing this comprehensive list of Blog Commenting sites. All of the posts on your blog are having informative and valuable content. Your article is very helpful for me and clears all my doubts. So, thanks for sharing this post. 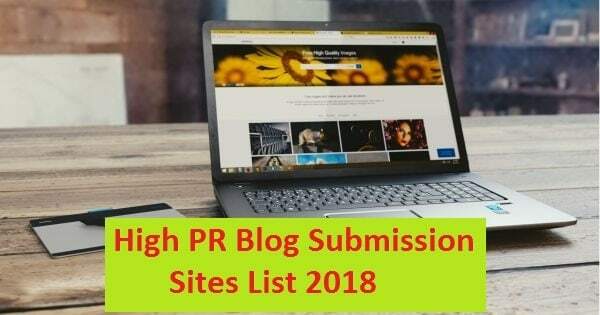 Thanks for sharing high PR article submission site list 2019, above all links are very helpful for backlinks. it’s very important to generate backlinks on web site. Very useful information and blog submission sites list. It is very helpful to me to submit my site and articles. Thank you for putting together in one place. I really appreciate your hard work, KEEP IT UP.